Theme #3: What are the characteristics of Mars' modern climate? Science Background: To understand Mars' ancient climate, and whether it might have created environments habitable for life, first we need to understand Mars' climate today. Like Earth, Mars has seasons, clouds, and both permanent and seasonal polar caps. But unlike Earth, Mars is unaffected by oceans, or by the cycling of water between clouds, rain, groundwater, and seas. Understanding Mars' climate provides basic insights into how atmospheres work, and it helps us to understand how a planet that once had flowing water could become the frigid, hostile desert that it is today. Modern Martian climate has seasonal variations in the abundances of water vapor, water ice clouds and hazes, and atmospheric dust. During southern summer, when Mars is closest to the Sun (at perihelion), solar heating can raise massive dust storms. Regional dust storms - ones having a 1000-kilometer scale - show surprising repeatability Mars-year to Mars-year. Once every decade or so, they grow into global-scale events. In contrast, during northern summer when Mars is furthest from the Sun (at aphelion), there is an equatorial water-ice cloud belt and very little dust in the atmosphere. Atmospheric water vapor varies in abundance seasonally, with the greatest abundances in each hemisphere's summer after the seasonal polar caps have sublimated into the atmosphere. During winter, both water and carbon dioxide frost and ices form on Mars' surface. These ices form the seasonal and residual polar caps. The seasonal caps - which form each autumn and sublimate each spring - are dominated by carbon dioxide ice. The residual caps - which persist year after year - consist mostly of water ice at the north pole and water ice with a thin veneer (a few 10's of meters thick) of carbon dioxide ice at the south pole. The Pre-CRISM view: Each mission to Mars has made new advances in understanding climate. 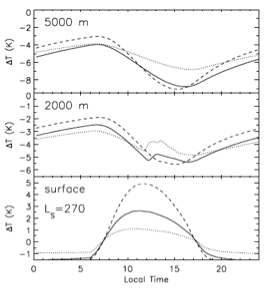 Seasonal variations in water vapor abundance were discovered by the Viking Orbiters. The biggest advances in understand atmospheric dust and ice have come from TES and THEMIS. Both instruments are capable of estimating the amounts of dust and ice in the atmosphere, and both measured changes from Mars year to Mars year. These two instruments and the Mars Orbiter Camera are responsible for much of what was known about the polar caps prior to MRO. Question 3.1: How does atmospheric dust affect climate? Mars' atmosphere is so thin and wispy that solar heating of dust and ice in the atmosphere - not heating of the atmospheric gases - is more important in driving weather. Small, suspended particles of dust and water ice - aerosols - intercept 20–30% of incoming sunlight, even under relatively clear conditions. So variations in the amounts of these aerosols have a huge influence on climate. 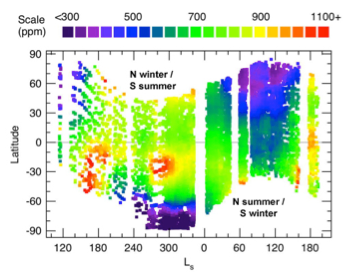 CRISM has taken three major kinds of measurements of dust and ice in the atmosphere: targeted observations whose repeated views of the surface provide a sensitive estimate of aerosol abundance; special global grids of targeted observations every couple of months designed especially to track spatial and seasonal variations; and scans across the planet's limb to show how dust and ice vary with height above the surface. CRISM's atmospheric measurements complement those of MRO's two main meteorology instruments, the Mars Color Imager and Mars Climate Sounder. Discovery - bright, cold dust: CRISM's measurements of atmospheric dust show that it is brighter than had been thought, so it absorbs about 25% less sunlight. As a consequence, dust warms the atmosphere less than had been thought. Temperatures of Mars' atmosphere are nearly all calculated by computer models - there isn't a Mars weather network in place for real measurements! Less heating by dust means that - at most altitudes - the atmosphere is colder than computer models had predicted. These graphs show the change to atmospheric temperatures predicted by meteorological models using CRISM measurements of dust brightness. The three curves in each graph simulate clear, normal, and dusty conditions. At 2000 and 5000 meters altitude, the atmosphere is colder that previously thought because less sunlight is absorbed; the surface is warmer because more sunlight reaches it. "Ls" is solar longitude, where 270° is northern winter / southern summer solstice. "Local time" is in hours since midnight. Discovery - layering of the atmosphere: For many years, scientists had thought that dust in Mars' atmosphere was "well-mixed" - meaning, present in the same proportion to gases at all altitudes. MCS and CRISM together showed that this is not true. Dust is concentrated in the lower atmosphere, also concentrating heating there. Water ice aerosols tend to occur as a capping layer above the dust, although water ice clouds also occur near the winter poles and over high mountains. 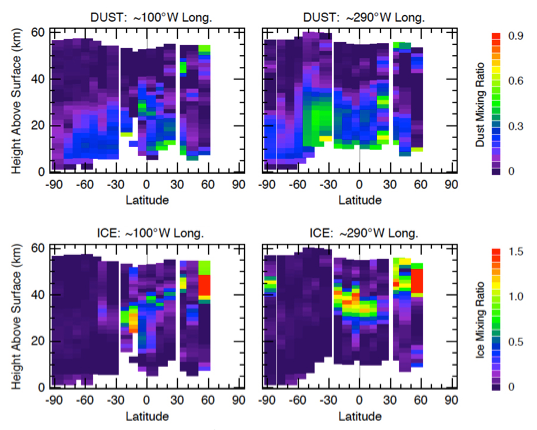 These charts show vertical structure of dust and ice aerosols in the atmosphere. The color scale shows mixing ratios of dust (top row) and ice (bottom row) at two different longitudes. "Mixing ratio" is a meteorological term, meaning the proportion of some constituent in the atmosphere. Latitude, on the horizontal axis, includes the average mixing ratio in a 10° latitude band. The vertical axis shows height above the surface. The measurements were taken during southern hemisphere mid-summer. Note that dust is mostly below about 35 kilometers altitude, and water ice clouds occur mostly as a layer above that. However near the equator at 100°W longitude, water ice clouds dip to lower altitudes over the volcanoes of Tharsis Montes. Question 3.2: How do non-condensable gases in the atmosphere vary seasonally? Mars' atmosphere has the un-Earthlike property that winter snow forms by freezing of the major atmospheric gas, carbon dioxide, causing atmospheric pressure to vary by about 25%. Previous to MRO, there were limited measurements of how this gas's freezing and sublimation affects concentration of other atmospheric gases. Although water vapor and ozone have been measured by Viking Orbiters and Mars Color Imager, they are also affected by other factors: water vapor condenses out too, and ozone is chemically active, being created and destroyed. To track concentration and dilution of the rest of the atmosphere by the carbon dioxide cycle, measurements of a more "inert", non-condensible gas is needed - such as nitrogen, argon, or carbon monoxide. Discovery - seasonal variations in carbon monoxide: Of the major inert, non-condensible cases, CRISM is most sensitive to carbon monoxide (CO). Abundance of this gas can be estimated from nearly any CRISM observation of the surface. CRISM found an average CO abundance of about 700 parts per million (ppm), in agreement with previous estimates of average abundance. Each winter, the gas reaches higher concentration up to nearly 1100 ppm along the margins of the winter polar cap, as residual gases are concentrated by carbon dioxide freezing out; each summer, it is diluted to under 300 ppm as sublimating carbon dioxide frost floods the atmosphere. Unexpectedly, regions of high CO concentration also form away from the poles, due to circulation of residual, concentrated atmosphere. This chart shows variations in the amount of carbon monoxide in the atmosphere. Latitude, on the vertical axis, includes the average in a latitude band covering all longitudes. "Ls" on the horizontal axis is solar longitude, where 0° is northern spring / southern autumn equinox, 90° is northern summer / southern winter solstice, 180° is northern autumn / southern spring equinox, and 270° is northern winter / southern summer solstice. The large white areas in the north around Ls 270° and in the south around Ls 90° are in winter polar darkness and not measured by CRISM. The color scale shows the mixing ratio of carbon monoxide at a latitude and season. Note low values in each polar summer when the sublimating carbon dioxide seasonal cap dilutes other gases in the atmosphere. Question 3.3: What processes occur during formation and sublimation of the seasonal polar cap? The south polar seasonal cap has a bizarre variety of bright and dark streaks and spots that appear during spring, as carbon dioxide ice sublimates. Mostly, they occur in a dark part of the seasonal cap called the "cryptic region". Prior to MRO there were various ideas for processes that could form these strange features. CRISM's ability to distinguish and map even small spots of water and carbon dioxide ice enables it to help unravel processes in Mars' very un-Earthlike polar regions. Discovery - carbon dioxide geysers: A leading model for formation of the strange features in the southern seasonal cap is carbon dioxide geysers. According to this theory, the cryptic region is dark because seasonal ice forms a clear slab through which underlying soil is visible. In spring, the slab acts like a greenhouse and sunlight heats the soil. The base of the slab evaporates and carbon dioxide gas builds up. Eventually in the heat of day, the slab ruptures and gas rushes out, carrying soil with it. The soil settles out on the surface forming dark spots. CRISM has watched the dark spots grow during southern spring, and found that bright streaks forming alongside the dark spots are made of fresh, new carbon dioxide frost, pointing like arrows back to their sources - the same sources as the dark spots. The bright streaks probably form by expansion, cooling, and freezing of the carbon dioxide gas, forming a "smoking gun" to support the geyser hypothesis. These movies show a time series of CRISM images of dark spots, as they grow in the springtime southern seasonal polar cap. "Ls" is solar longitude, where 180° is southern spring equinox, and 270° is southern summer solstice; the movie covers early spring. The version at left is enhanced visible color; the version at right uses the same data, but shows surface composition. Light blue-green is water and carbon dioxide ice; dark spots are soil; and fresh carbon dioxide frost is magenta. Note that as dark spots grow, carbon dioxide frost forms alongside them.